May 15, 2010 July 19, 2018 - 22 Comments. In the early 80s I tried to impress my very traditional grandmother by taking her to a recently opened restaurant on Academy Boulevard. What was not to like? The restaurant shared the mellifluous name she had proudly worn for over fifty years. It was a locally owned and operated and had earned several awards. It boasted a multi-page menu. Surely Garduno’s of Mexico offered something she would like. It turns out the restaurant’s name was the only thing she liked. One nod of disapproval after the other ensued as she meticulously perused the menu, a compendium of Mexican and New Mexican appetizers, entrees and desserts. Scanning the descriptions carefully, she dismissed the contemporary interpretations of the foods on which she was raised and had prepared for more than eight decades. My mind floods with sweet memories of my cherished Grandma Piedad every time I visit a restaurant offering contemporary twists on traditional New Mexican food. Such was the case when my friend Bill Resnik and I first visited the Blue Cactus Grill, a modern and attractive new restaurant on Albuquerque’s West side, just north of Paseo del Norte on Coors Boulevard. Bill reminded me that the Blue Cactus Grill is situated at the former site of La Salita which lasted less than two years at the location. Even though we hadn’t enjoyed our sole visit to the west side rendition of La Salita, Bill considers it a community service to accompany me on visits to new restaurants (especially when I’m buying) so he was game to try something new. The Blue Cactus Grill was launched by Mark Corsonatti and his fiance Jamie, both of whom endeared themselves to guests by their peripatetic presence. Like all true ambassadors for their businesses ,they treated their guests like family and became as beloved as their restaurant’s food. In February, 2010, Mark and Jamie sold the restaurant to Janis and Eddie Crispin, native New Mexicans. who have kept everything on the menu save for revamping the red and green chile and adding “& Bakery” to the restaurant’s appellation. Bakery treats under glass are one of the first things you see when you step into the east-facing restaurant. The Blue Cactus Grill is about a mile away from restaurant row on Coors Bypass where a phalanx of mediocre chain restaurants blights the landscape. Tragically the parking lots in front of those chains are generally packed and worse, sometimes you’ll see lines of diners waiting outside to be called to a table. On Friday nights, the parking lot in front of the Blue Cactus Grill fills up, too. Many of the diners who used to head to horrible chains nearby have realized the Blue Cactus Grill is something special. In terms of ambience, the decor at the Blue Cactus has a New Mexico traditional meets new west contemporary feel to it. Faux adobe half-walls, stripped pine latilla poles and braided chile ristras seem at home among the exposed ceiling ductwork and painted concrete. Metal sculptures of several types of tall cactus hang on adobe colored walls. There is relatively little color in the restaurant…until you get to the menu where there’s plenty of red and green. The menu is replete with traditional New Mexican offerings interspersed with the contemporary interpretations my grandmother would have frowned upon. Hand-cut angus beef steaks, green chile spare ribs, tequila-lime chicken, empanada burgers and more surprises make it an interesting and exciting menu. The complementary salsa with yellow and blue corn tortilla chips is an early indicator that perhaps the promise of exciting food will be delivered upon. The chips are crisp and thick enough to dredge up the large amounts of salsa I like on my chips. The salsa is good, make that very good, as in good enough to be bottled and sold good. It’s of medium thickness so it doesn’t run off your chips onto your hands. It’s also of medium piquancy with a jalapeno based bite. It’s the type of salsa you might have two bowlfuls of before your entrees arrive. Counting calories is an exercise in large numbers if you have some of the appetizers. The Sandia Dip appetizer, for example, is crafted from the restaurant’s signature green chile white cheese sauce and refried beans topped with sour cream and served with warm fried tortillas cut into chip-like triangles. That green chile white cheese sauce is one of those contemporary twists even traditionalists will have a hard time disliking. Traditional entrees include chile rellenos, tamales, enchilada plates, stuffed sopaipillas and tacos, all of which are served with beans, rice and sopaipillas and by request, a side of sour cream. Your best bet is the Cactus Combo plate with either two or three selections. With combo plates you also get a soft or hard taco. 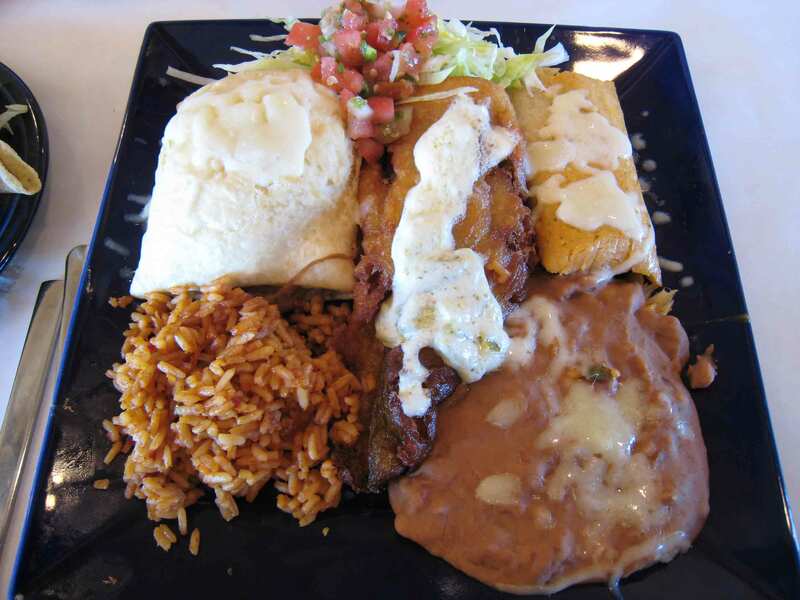 The combo plate pictured above includes a stuffed sopaipilla, chile relleno and tamale. Conspicuous by their absence are red and/or green chile. That’s because I ordered both. They were delivered in crispy tortilla shells, the type of which are sometimes used for taco salads. The refried beans are very good with shredded white cheese melted on top. As for the chile, both red and green are quite good. Neither are especially piquant, but the green, in particular, possesses qualities that remind you with every bite that chile is a fruit (never mind that it is New Mexico’s official state vegetable, along with the pinto bean). The green chile has a hint of smokiness from the roasting process. The red chile is light in texture and rich in flavor, seasoned very well. 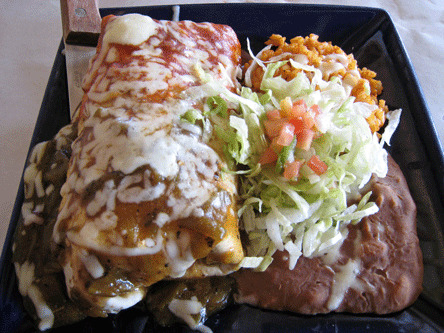 From among this combo, the stand-out is the chile relleno which is among the best in the city. Two things make it a stand-out. First, instead of stuffing an anemic chile with no bite (Poblano or Anaheim come to mind) with Cheddar of mild sharpness, the Blue Cactus Grill stuffs a real New Mexico chile with a flavorful white cheese then tops the relleno with a green chile white cheese sauce that’s positively addictive. Secondly, while the batter may not be tempura thin, it’s thin, crispy and sheathes the chile in flavor. It doesn’t crumble off when you cut into the relleno. Although green chile cheeseburgers are practically a religion in New Mexico, it might be possible to tire of them (not that I’ll ever reach that level). If so, the Blue Cactus Grill offers two alternatives. One is the Empanada Burger, a half-pound Angus beef hamburger wrapped in a flour tortilla, stuffed with Monterrey Jack cheese and green chile then deep-fried to a golden brown hue. According to the wait staff, this burger already has a legion of fans. 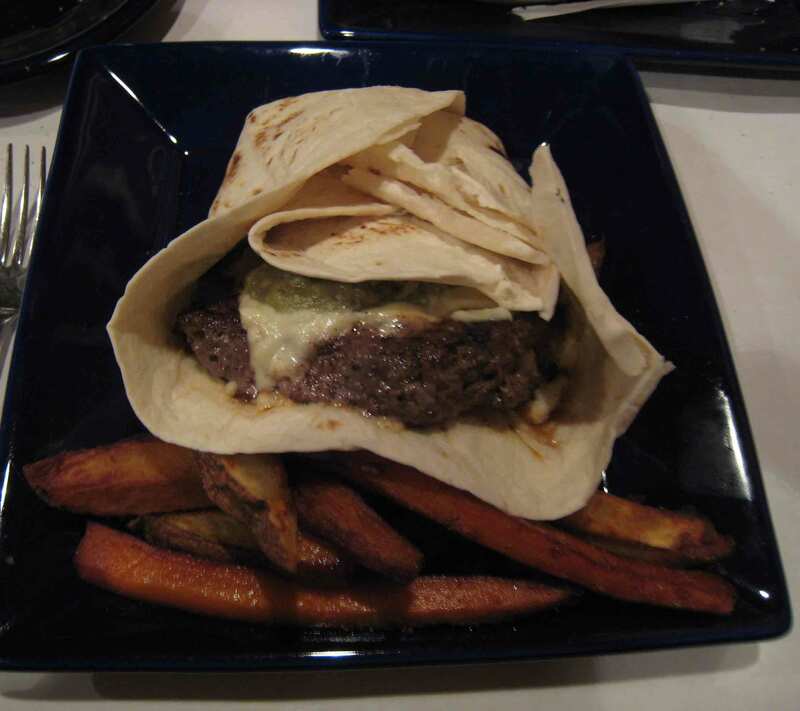 Another alternative is the Guacamole Burger (pictured above), an eight-ounce Angus beef hamburger wrapped in a soft tortilla filled with green chile white cheese sauce and guacamole. This is an ultra-rich burger bursting at its seams with flavor. You won’t miss mustard and ketchup with this one. It’s served with homemade papas, a mix of sweet and white potato fries cut thick. I may have a new favorite papa in town and it’s these sweet potato papas, plus-sized circular-cut potatoes which are crispy on the outside and tender inside. 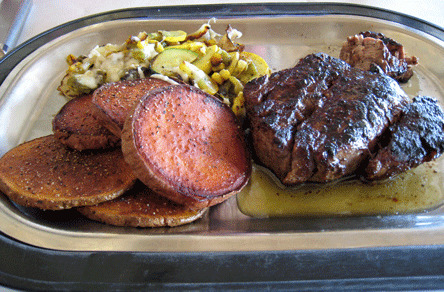 The grill section of the menu includes two steaks that won’t be outdone by any steak on Albuquerque’s west side, especially the one served at that pseudo Australian steakhouse just up the street. These steaks are hand-cut upon order and are absolutely fantastic. Your two options are a seared and seasoned eight-ounce (larger cuts available) Angus filet or a 14-ounce seared or blackened Angus ribeye, both priced well under $20. Not only are these beauties prepared to your exacting specifications (order them “medium” and you get a hint of pink with plenty of juiciness), they’re seasoned to perfection with a seasoning mix that includes salt, pepper, garlic and a menagerie of other ingredients ownership won’t divulge. If taste bud clues are on target, the seasonings hint at piquancy, citrusy and maybe even smokiness. Only the now defunct Great American Steakhouse seasoned their steaks this well. The Angus cut of beef has an optimum level of marbling for a high degree of flavor and tenderness. 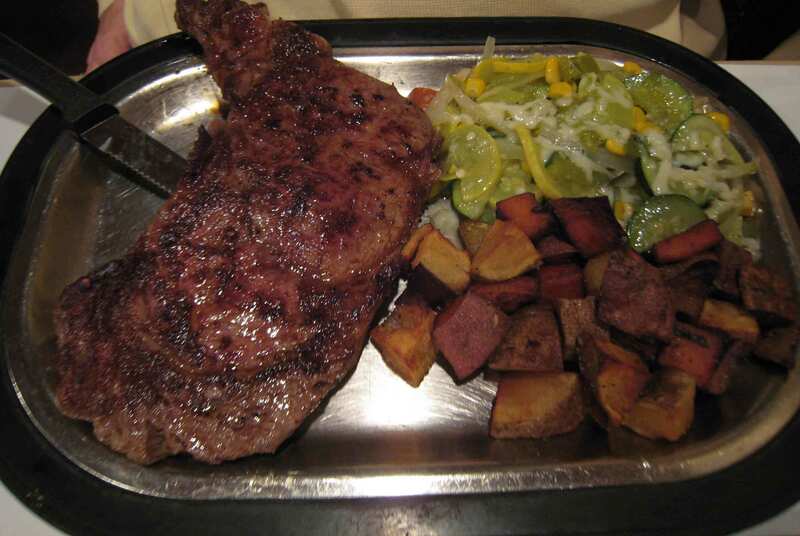 The Blue Cactus Grill’s ribeye is as tender and delicious as any steak in town as is the Angus Filet. I’ll stake my reputation on this steak! For the best of two worlds–steak and New Mexican food–try the Angus Filet Burrito, a thick flour tortilla engorged with bite-sized chunks of tender filet, potatoes and beans slathered with your choice of chile. The dawn of 2009 as with the promise of any new year was exiting for many reasons, not the least of which was the inauguration of breakfast and Sunday brunch at the Blue Cactus Grill. The breakfast menu makes up for its brevity with the high quality for which the restaurant is earning a reputation. Standards such as the ubiquitous New Mexican breakfast burrito are available, but for a special and unique treat, ask for the breakfast empanada with red and green chile (Christmas style). The breakfast empanada is a deep-fried tortilla encasing eggs, potatoes and your choice of bacon, sausage or chorizo. Despite being fried, this is not a greasy or heavy breakfast entree. In fact, it’s surprisingly light and absolutely delicious. Every ingredient is prepared to perfection, a hallmark of this restaurant. In its May, 2010 issue Albuquerque The Magazine awarded the breakfast empanada a Hot Plate award, a select honor accorded to the Duke City’s most intriguing foods, wines, events and people. The menu was once limited to two desserts–an apple empanada akin to apple pie a la mode or a Snickers empanada, the Blue Cactus Grill’s twist on an old favorite–until Janis Crispin added her baked treats to the menu. I’ve had and have loved deep-fried Snickers, but this dessert takes Snickers to a new level. A Snickers bar is actually wrapped in an egg-washed flour tortilla then deep fried and drizzled with chocolate and powdered sugar. As if that’s not rich enough, it’s served with two scoops of ice cream. This is the definition of decadence. 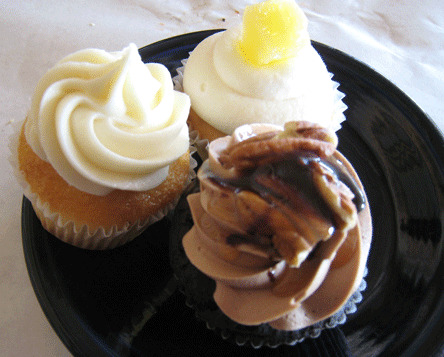 The new dessert additions to the formidable Blue Cactus Grill menu are baked goods, including more than 30 different cupcake flavors. Light, moist and frosted with ethereally rich butter cream frosting applied generously, the cupcakes come in such creative and delicious flavors as bubble gum, cotton candy, pineapple, chocolate turtle and cheesecake. The pineapple cupcake is akin to a pineapple upside down cake in miniature topped with a dollop of heavenly pineapple flavored frosting. Other baked good offerings include cakes, cookies, muffins, pastries and more. If you’re headed to the Coors Bypass restaurant row for a predictably boring meal at one of the chains, take a slight detour and visit the Blue Cactus Grill. My grandmother might not have approved of the restaurant’s approach to all the menu entrees, but I’ve been won over by some of those contemporary twists this terrific restaurant offers. This is a fun restaurant with personality, warmth and great food. We’re very disappointed to see this restaraunt has closed. We were hooked especially after ALL the well known restaraunts began making such terrible food. This was our new New Mexican dinner fix and now we have nothing close to quality left. Please come back. Just an FYI – liquor license came through and I thought things were looking up. We arrived yesterday to find the business closed and the space for rent. 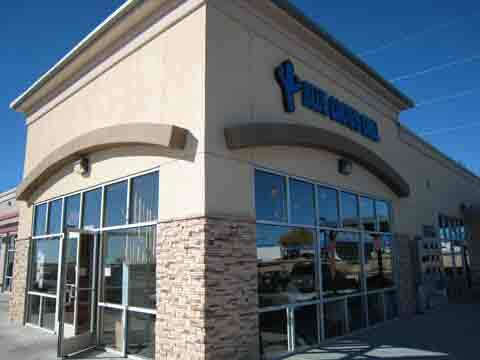 Have been to Blue Cactus Grill since we purchased a 50/50 coupon on KKOB and we loved it! It was the first time we tried it and have been back 3 more times in a month. The new owners Janice & Eddie will be getting their liquor license very soon (early Aug. sometime) and were so pleasant and helpful. The menu is being changed somewhat and when I suggested a vegetarian fajita they were very interested in hearing what I thought would make it work. They are a family owned and run restaurant with the older kids helping serve so I’d say that maybe the service others received might not have been the best, we’ve had nothing but EXCELLENT service in the evenings when we’ve been there. I’d suggest people try to remember what it was like when you were learning ~ even in the month we’ve been going we’ve seen improvement! Gil, I’d suggest you wait a bit for the liquor license to come through and the menu changes and try it again. I loved it and will be back again and again. We’ve been to Blue Cactus a couple of time is the last two months. We were not impressed. We were there last night and my son tried to order the green chile ribs. The waitress said they ran out of these at lunch ??? The last time we were there they were out of Ketchup. I should have reminded them the CostCo and Sam’s were just up the street. So anyway, he ordered the guacamole burger instead — just a plain burger in a tortilla with guacamole and cold fries. My wife ordered a carne adovada burrito. The little bit of red chile on the plate was close to tasteless. We used a 50-50 coupon so the bill was only $6 plus tip. Ended up spending a total of $11 for the three of us. Our comment as we were driving away was that the meal wasn’t even worth $11! Needless to say, we are not going back. Recently tried BCG and was not all that impressed, which seemed confirmed by a more than half-empty restaurant at what is the busiest time for sit-down restaurants on Friday night. Even though there is a weak presence of New Mexican/Mexican restaurants west of the river it would be down my list. One table away the diners returned two plates of food to the kitchen for unknown reasons. Blue Cactus was my all time favorite restaurant (I would actually crave their food), until the original owners left. The new owners seemed to want to hide the fact that the restaurant had changed hands, keeping everything the same (trying to). I still enjoy the food but not as much as when the original owners had the restaurant. They were wonderful people and I will miss them. The food seems to have changed a bit, wasn’t quite as impressed last time I was there. I hope the new owners realize how good the Blue Cactus used to be and go back to preparing everything the way it used to was. Blue Cactus was my all time favorite restaurant (I would actually crave their food), until the original owners left. The new owners seemed to want to hide the fact that the restaurant had changed hands, keeping everything the same (trying to). I still enjoy the food but not as much as when the original owners had the restaurant. They were wonderful people and I will miss them. The food seems to have changed a bit, wasn’t quite as impressed last time I was there. I hope the new owners realize what they had and go back to preparing everything the way it used to be. While the food is still good, the service seems to have suffered slightly with the departure of the original owners, Jamie and Mark. I’m sad they are no longer with the business, and sadder still that the new owner does not mind his waitstaff hanging out at the cash register, reading the newspaper and texting on their cell phones. Went back for another visit last week. We were sad to see how empty it was on a Saturday night. Everyone else there seemed to be regulars who’d discovered this gem. We brought our two children (baby and toddler) The staff was very helpful in accommodating them. Our waitress even came back to tell us the chicken enchilada we’d ordered for our toddler might be too spicy and recommended the cheese enchilada instead. I had the combo plate with carne adovada stuffed sopapilla and the shredded beef tamale. I love the red and green chile in the tortilla bowls. It lets me add just the right amount of spiciness, plus I was able to give our toddler some rice and beans that didn’t have chile on them. I only wish we could afford to eat more often so we could enjoy this delicious food more often. We just returned from another great breakfast at the Blue Cactus Grill. Our Breakfast Burritto and Breakfast Empanada with 2 sides of the delicious Green chilie Hashbrowns were both delicious and filling! All ordered and promptly served hot at the table. With coffee for 2 our bill came to just over $20. I have to say for us – flying star is fast becoming a distant and surpressed memory. If lately you have felt cheated by over-priced food and ever shrinking portions – you owe it to yourself to try this place. I saw this place open up near my place in the Cottonwood area. I was tempted to try and and after reading this review and several others my family and I made a rare trip out to eat. Our budget only allows us to eat out about once a month and this was well worth it. We decided to sit out on the patio so our 10 month old son wouldn’t disturb anyone if he got too loud. The only complaint about our visit was that the sun shone in on the patio as it was setting. Something to block the sun at least a little hanging down on the side facing Coors would be nice. After all who wants to look at passing cars when there’s a wonderful view of the Bosque and the mountains in the opposite direction. The salsa was some of the best I’ve ever had. If they sold it by the jar I’d probably have to purchase some. The owner came out to visit with us before our food arrived. We found out his son was born the day before ours. My Wife and I each got a combo plate. I had the Chile Renello and the stuffed sopapilla with Carne Adovada. She had an enchilada and stuffed sopapilla with chicken. All of our food was delicious. Just the right amount of spiciness with red and green chile. Overall the food was relatively light and delicous. After visiting too many Mexican or New Mexican restaurants where everything is coated in cheese and grease this was a nice change of pace. I was tempted to get the 3 dish combo plate but I’m glad I stuck with 2, it was just the right amount of food. Our total bill with tax and tip was less than $30. I felt like we were getting gourmet food for a very low price. The service was excellent, everyone was very friendly. We will definitely be coming back. Wonderful food, even better service! Much more satisfying than most restaurants we frequent, and we eat out a lot. Glad we made the trip from the heights, it won’t be our last. A nice appetizer no one has mentioned, is the eye-candies served at some seatings….a view down into the valley as the Sandias glow at sunset; the twinkling city lights that follow; a full moon rising over the crest; yada yada. The first time I read on a menu “A whole green chili [sic] stuffed with cheese” I shivered with whatever-you-might-call-it re how potent it must be; t’was like the same reaction envisioning a Frenchperson dining on a bowlful of onions. Surprize Surprize! it turns out both are delightfully wonderful. Per Gil’s note that “There is relatively little color in the restaurant…” Indeed that is a great trick used by artists which Mark, the owner, uses to shock and awe us by placing a contrasting painting before us to dine on. On the upper portion of a rich blue background, a light golden, sopaipilla-like(?) bowl, which cups the colorful red Spanish rice and brown beans, is set beside shredded green lettuce dappled by red tomato niblets. Fronting these were two, angled golden rellenos, deco-ed [sic] with a white cheese drizzle, guarding a smaller taco-shell bowl containing a bit of green chili which I opted for. Yes, as Y’all will probably be aghast too, the rellenos weren’t drowning (aka going soggy) in a pool of green chili. “How cheap is this and where is a spoon?” I muttered to myself as I searched to see if I’d missed one in my nicely sized, cloth! napkin. Du—uh…..seeing the shell was pinched, I picked it up and poured some chili over the two ‘chews’ of relleno I’d sliced off. A la modee! A touch of brilliance as a way to keep the crisp batter crisp!!!!! Oh, and did I mention everything was Muy Sabrosa y Suficiente? Hmmm, it’s now mid February and the staff is still hospitable and attentive as others have noted. As I drove home, I began wondering what the Blue Cactus creativity can do if they added something with Chicharones. If anyone else is also, be sure to ask next time. In the meantime, I’ll have to get back to try the Green Chili Baby Back Ribs so as to compare them to another place’s red chili ones, further up the North Valley road! PS Cerveza y Vino are coming in a few more days. Their breakfasts are fantastic…I’m in love with the empanada with sausage and green chile. I know it’s fried, but it’s not at all greasy. Special thanks to them for understanding how it is to dine with a toddler…Jamie gets this and makes sure to always give a special hi to our son, fill his sippy with juice and make his scrambled cheesy eggs exactly how he likes them. It is my Husband and I’s favorite restaurant!! THe staff is friendly and the food is great!! I love the Tequila Chicken and my husband says their stuffed shredded beef sopapilla is to die for—the best he has ever had. I also love it that it is NOT A CHAIN…..Let’s ALL help out the MOM and POP type of Restaurants and stop giving money to the chains!! My husband and I just tried BCG. The restaurant was well-decorated and comfortable. The service was friendly. I did receive a ground beef taco instead of the shredded beef I had requested, but it was no biggie. The salsa was tasty and flavorful. I also agree that the chile rellenos are good. Mine was fried perfectly, with a delicious batter and cheese sauce. I would call it the best chile relleno I have had, except that the chile that was used lacked the flavor and spiciness to which I have grown accustomed here in NM. For that reason alone, Sadie’s still reigns supreme in my book for chile rellenos. My husband ordered the Empanada Burger, of which he shared a bite, and it was delicious. While I wasn’t too impressed with anything else we ordered, we will still consider stopping at BCG again if we find ourselves in the Cottonwood area and hungry for non-chain Mexican food. My wife and I just tried BCG today for first time. Very good. Staff very friendly, owners came out to visit, just a very nice restaurant. Many things on the menu I’d like to try. I’ll be coming back to do just that. On our first visit for dinner – Great service, Great food served hot and at reasonable prices! Can’t wait to sample their breakfast! OMG!! This is our new favorite and they just started to serve breakfast enpanadas!!!! We also hope that lots of people decide to try this place instead of the other “fast food” type restaurants that surround it. The owners are fabulous sweet and we just love this place. I tried BCG last night and really enjoyed my meal. The salsa was super fresh with an outstanding flavor. I was also pleased that the entrees weren’t hidden under a layer of congealed cheese as they are so many other places in town. I would definitely eat there again. Unfortunately, my husband and I were the only diners in the restaurant while we were there; I hope others will discover this place. Thanks for the tip, Gil. We visited BCG today and could not find enough superlatives to describe the food. (Ann had the combination with chile relleno, tamale, and shredded beef taco (in soft blue corn tortilla), while I had the carne adovada burrito.) This is a standout that we would have to rank up there with (yes!) Mary & Tito’s, Sophia’s, El Norteno, Rancho de Chimayo, and Los Equipales. What astonished us most was the attention to detail and the very obvious care and pride in the preparation of the food. As you pointed out, Gil, CRISP batter on the relleno; a tiny, almost inconspicuous bit of pico drizzled on the side salad (but what a difference it makes! ); the adovada very well seasoned and tender but not (as too often elsewhere) drowning in a lagoon of florescent red chile; the sopapillas light, fluffy, obviously freshly made. Also of interest: The food never loses sight of its New Mexican origins, but the all of the small twists kick it into the 21st century. Service excellent also, and owners charming. Cost is modest for the quality. Buen suerte to this place. Sounds delicious! We’ll have to check out it out.